So you already know what was on my new baby wishlist, but today I wanted to share some alternate gift ideas that you could buy for the new Mama or baby (and Dad & older sibling too) in your life that I’ve recently discovered from some absolutely awesome brands across the internet. Some are bigger than others, some homemade and some not, but I for one would be thrilled to receive any one of them! Baby brain is a real thing. It takes over during pregnancy and then once bump has turned to baby it hits a whole new level. When Florence was born, I just remember having to write EVERYTHING down or I’d forget. A pretty notebook like this ‘Blame the Baby Brain’ one from Martha Brooks Stationery. It comes in a bunch of different colours and is a steal at £12.95! Never underestimate the value of a decent meal for new parents. Chances are the last thing they want to do having just welcomed a baby into the world is worry about food shopping or what to cook for tea. Why not treat them to a grocery subscription box for a couple of weeks? There are loads of brands out there that do them, Gousto and Hello Fresh to name a few. Alternatively you could cook a second batch of whatever you’re having for tea and drop it round to put in their freezer! Oh my goodness, if this isn’t the loveliest little gift idea for a new mother I don’t know what is. It’s a diary covering five years in time where you write a one liner about each day to record a special memory or ordinary moment you want to remember of your little one’s childhood. I think this would make a wonderful keepsake to look back on. I love this idea. It’s basically a box of date night ideas for new parents to pick from each fortnight to make sure they’re touching base and getting in some quality time as a couple – God knows that’s not something many of us manage to do very much, but it’s oh so important. They’re mostly things you can do either at home or with baby with a couple of special nights out thrown in too. They also donate 10% of the profit from each box to charities supporting families affected by Postnatal Depression. Who knew there was such a thing as biscuit art? Well, I recently discovered Biscuiteers when they contacted me about working together for valentines (watch this space) and soon ended up drooling over their amazing range of hand iced biscuits! 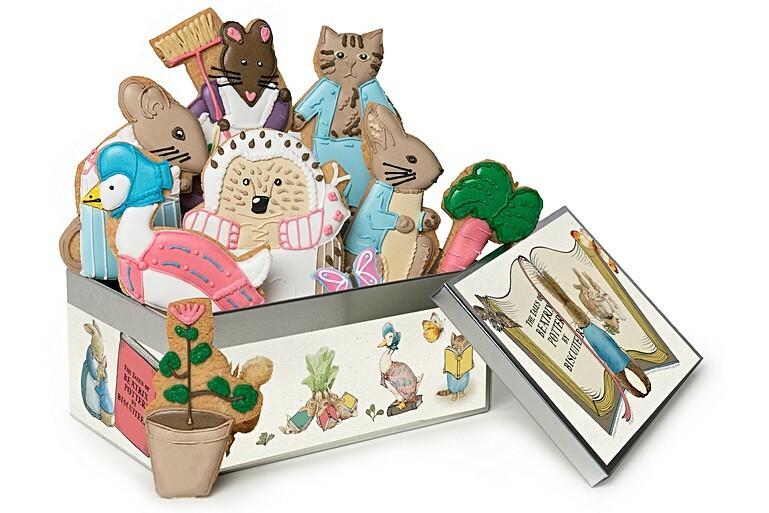 This gift set of Beatrix Potter biccies complete with a gorgeous coordinating biscuit tin would make a lovely gift for a newly grown family and would be perfect for those feeding time munchies! Okay, okay, so I bang on about these all the time and how much I love them, but I recently came across a couple more brands who design and sell absolutely gorgeous ‘giant Muslins’ as I call them. My favourite at the moment has to be this Rainbow Chevron one from Lil’ Cubs and I love their new Elmer collection too! Another brand worth checking out when it comes to these baby must haves is Pattie and co who donate £5 from the sale of every blanket to Tommy’s the Baby Charity. You know me, I love a bit of twinning and the potential of adding another little poppet to match with into the world has me way too excited. Primrose and Bear make gorgeous bright personalised t-shirts for littles and these rainbow name tops would be perfect for a set of siblings! I found these awesome little ‘postable’ gift sets designed for older siblings to celebrate their new big brother/sister status. They are £12.99 and have some fun shaped crayons, a badge and a personalised pencil inside. I know that Florence would LOVE to receive something like this as she is well into drawing and colouring at the moment and at a time when the main focus will be on the baby, it’s a great gift idea to make her feel a bit special too! After all, she’s taking on a very important role! These are just some of the gorgeous alternative gift ideas for new parents and their littles that I’ve stumbled across on Instagram over the last few weeks. How great are they? I regularly share gems like these over on my Instagram stories as I find them so make sure you’re following me if you too love discovering new, often independent brands with fantastic ideas and products. I hope I’ve given you some ideas for gifts that are just that bit different. This weekend was a busy one for baby and I. We had our risk assessment at the birthing centre and I finally finished writing my birthing plan on Saturday and then today was my ‘Baby Sprinkle’. Me and 12 of my ladies got together for a girly afternoon celebrating our little boy’s impending arrival. Unlike the huge (and wonderful) Spring time baby shower I had while pregnant with Florence, it was a perfectly quiet and intimate affair this time around. Now just to warn you, the blogger in me failed to get many photographs of today at all, and there is just this one of me from the whole afternoon… super flattering I know. It may not be instaperfect, but it is a memory and those are just as magical. We went to Puddings in Maidstone where we had full private access to their upstairs room which was the perfect fit for our little group. By happy coincidence the walls are painted in a sumptuous navy blue which complimented the gold theme of chosen for the decor and of course was a nod to our blue bump. We sat down to a delicious afternoon tea of sandwiches, scones and cakes made in house. While we did play a couple of games – Guess the size of the bump & ‘Would she rather’ – we were quite limited by the space so instead everyone was invited to decorate a little bodysuit however they wished and the best would be judged by Sean and awarded a prize. It was so funny how competitive everyone became and how into it they were – the room fell almost silent! The final results were amazing too. Among the greats we had a ‘Storm Pooper’, a rainbow and a rabbit but my friend Helena’s ‘Blue Floyd’ Band T design took the top spot. ! It even has personalised ‘tour dates’ on the back! I also asked everyone to complete a page in a DIY first words book by drawing in a picture to match a letter of the alphabet. My friend has offered to digitise them all and the we are going to have them published as a proper book. I love how through such a simple and crafty activity baby will have a bunch personalised gifts made with love. Decor was kept low key (and low budget!) and we stuck with some Ginger Ray accessories, homemade game cards- free printable anyone? Watch this space – and a DIY gold balloon hoop decoration. We were gifted some beautiful clothes and toys for baby boy which we opened once back at home. It was so nice to spend an afternoon with some of my favourite people, child free and actually be able to have uninterrupted conversation. The cake was just an added bonus!